American Screen Printing Association Member Directory - New member screen printers and news. About: Boston Industrial Solutions, Inc. is a manufacturing technology company that manufactures and supplies advanced screen-printing inks and specialty silicone inks for textile and silicone rubber to screen printers globally. "It was my second year in college at Milwaukee institute of Art and Design. My professor told the class that we were going to a screen printer in a day or two. Holoubek Inc was looking for an intern for the summer. It would be a great chance for an aspiring artist to get a foot in the door of a local company. The day of the visit came. Lo and behold I was sick as a dog. How disappointing. Instead of rolling over and giving in to what fate had dealt, I called Holoubek and informed them of my predicament. "No problem" they said, "Just let us know when you can come in". I grabbed a pad of paper, pencils and markers (yes this was before personal computers) and I went to work coming up with ideas. The next day, feeling much better, I called them and made an appointment for the following day. Now, instead of being in the pack off students, I would get to meet with them, one on one! They were impressed with my talent and the amount of work I had done in just one day while sick in bed. They offered me an internship on the spot. Lesson. Make your own luck, don’t give in or give up. At Holoubek, little did I know I would meet my mentor, future boss, and long time friend, Dave Gardner, a soon to be legend in the screen printing industry. We soon became friends and had a mutual respect for each other’s talents and work ethics. After graduating from MIAD, I worked the summer at Holoubek. Meanwhile Dave had moved back to Buffalo. He started his own company, Gardner Graphics and began a partnership with New Buffalo Shirt Factory. I continually called Dave informing him that he ‘needed to hire me’ as an artist so he could concentrate on his separations. He eventually gave in and I broke my mom’s heart by moving out of state to the Buffalo NY area. Sorry mom. We worked out of his basement for a year. Dave presented the idea of a new College Mascot line to Jon Weiss, owner of NBSF while I worked on Harley artwork. The mascot line turned into a huge success at a print show in Chicago. Sales people 3 deep were shoving their cards at our booth. The industry took notice and soon NBSF was signed with Salem Sportswear to provide printed mascot apparel for pro sports. We hit the big time. Gardner Graphics needed a lot of art fast. We brought on several new and talented artists. Now I was the mentor. Times change, and so do trends. The intense mascot t shirt fad faded. As it did, Gardner Graphics merged with NBSF and our subject moved from sports to the Rock industry. One of the best moments from this period I can recall was for a Garth Brooks shirt. We had created a beautiful portrait piece. The client told us that a full color piece like that would be tough to sell because they would have to charge something like 25 cents more a shirt. Dave told them, charge a dollar more. If it doesn’t sell, we’ll buy the remaining ones back. Our shirt sold out. Dave’s instincts and confidence always impressed me…and still do. Much of the artwork for the rock industry was provided, so the amount of artwork I need to provide dropped significantly. I noticed the trend and decided to head out on my own. 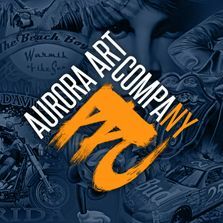 My wife and I started our own graphics company, Aurora Art Company. A Client based out of Chicago needed poster and program cover artwork for the Super Bowl, Big Ten, Final Four, College World Series. This kept us busy for many years. When this client retired, I got a bit nervous. He was 50% of Aurora Art Company’s revenue. I mentioned this to Dave in passing and he suggested I come back to NBSF, but not as an artist….as a separator. NBSF had just secured a deal to print for Disney. There was going to be a lot of art to separate. I took the challenge. For 6 years I separated at NBSF. But as I have learned, times change. Gildan purchased NBSF. I decided it was time for a change again. This was a big one again. My family up and moved to Maryland. I became the head color separator for G&G Outfitters retail division and also helped with difficult seps for their Creative Services division. This was a big step. I was responsible for samples and approving production runs. Work-wise, it was a good move. Family-wise, not so good. The kids were restless. The wife missed family. In the end, we found ourselves moving back to Western NY. Family and friends come first. I am now back in NY, just outside of Buffalo. The winters are definitely colder than Maryland…that I can attest. But its great to be near family and friends. Aurora Art Company is full speed ahead. If you need or know of anyone who needs artwork, graphics, logos or color separations, or if you just want to talk about the good-old days or maybe a future project you have, please feel free to look me up. I would enjoy speaking with you. Remember, never give up and make you own luck! " ASPA Celebrates 15th Year in 2019! American Screen Printing Association (ASPA) wants to thank everyone for supporting and helping us grow over the last 15 years. Our association has grown from just one original member (Big D CD Warehouse) to a community of thousands of members in over 120 countries offering screen printing, sign making, promotional products, digital imaging, embroidery/digitizing and printing supplies and equipment. In 2018, we added custom embroidery shops as a category for membership and have picked up many embroiderers and print shops that offer embroidery as a sideline. The free level of ASPA membership was reintroduced in 2018 and as you might imagine has brought us many new members from around the world. We lowered the cost of supplier/manufacturer membership and gained new members in that category as well. Coming soon in 2019, we're going to offer new features just for ASPA members including free advertising to promote weekly or monthly sales "specials" that you offer in your print shop or supplies/equipment business and we're going to expand the free "biography" articles that promote member print shops. The "how we started" print shop stories are popular and get lot of readership on our websites. We will explain the details in a upcoming newsletter--watch for it. Again, thanks for supporting ASPA over the years and we wish everyone great success in 2019! AZ Nighthawks Athletic Club Inc.